Baron Manfred von Richthofen, the leading ace of the First World War. Part 3 and conclusion: The Warbirds of W.W.I. In 1903 the Wright brothers made the first controlled flights in a heavier-than-air craft. The longest hop was less than 300 yards in length, but within a decade planes were flying 635 miles without a stop at speeds of up to 127 miles per hour and more than 2,000 people had learned to pilot planes. The aviation world was about to take a darker turn, though, as this new technology was soon to become a serious weapon of war. The first use of aircraft in an actual war occurred in 1911 when planes from the Italian Army, who were in a colonial war with Turkey, scouted over enemy lines in Libya. A week later Lieutenant Giulio Gavotti made the world's first live bombing run when he dropped four grenades out of his Taube monoplane onto Turkish troops below. On the ground the attack caused little damage, but much excitement. Despite Gavotti's bombing run the airplane entered World War II primarily as a reconnaissance tool and for that it was extremely valuable. For the first time generals could see the strength and location of forces behind the enemy lines and plan accordingly. During those early reconnaissance missions air crews from opposing sides would often wave as they passed each other in the air. Soon, though, pilots began bringing guns along to take the occasional pot shot at the enemy. Later some two-man planes were designed so that the second crewman would be able manipulate a machine gun for attacks on other aircraft. Armament for single seat aircraft was more difficult. The logical place to put a machine gun on such a plane was to have it fixed, facing forward just in front of the pilot. This way the pilot could aim the gun by pointing the aircraft. Most aircraft designs, though, had a single propeller at the front of the plane. Bullets from a machine gun placed at the best location would shoot off the propeller. In April of 1915 a Frenchman named Roland Garros put armor plating on his propeller to defect any rounds from his forward facing machine gun. The arrangement was so effective that Garros shot down five planes in a space of sixteen days. Still, the armor plating solution seemed unsatisfactory in the long run. Placing the gun beyond the arc of the propeller was one solution, but this made it difficult for the pilot to change ammunition drums and clear gun jams. One example of this was an incident that happened to L.A. Strange, a British pilot in 1915. Roland Garros with his Morane Bullet. With deflector plates attached to the propeller to allow a forward facing machine gun he downed five planes in 16 days. Strange was flying a Martinsyde scout which had its gun mounted on the top of its top wing. While engaged in an attack on a German plane the drum on his machine gun (which contained the ammunition) ran out. He reached up to pull off the drum and replace it with a new one, but it was jammed. Placing the control stick between his legs he used both hands to pull at the stuck drum. As he lifted himself up to get a better grip, the stick fell out from between his legs and his safely harness slipped off. The plane flipped upside down into a spin and Strange found himself hanging underneath the airplane with 8,500 feet of air below him. His only attachment to the aircraft was the drum which until a moment before he had been trying to pull off. Strange managed to climb from strut to strut and get his foot back into the cockpit to kick the stick and bring the plane back to an upright position. He fell back into the cockpit, but the shock broke the seat and he found himself sitting on the floor, unable to see out. Also the broken seat was jamming the cables so he could not move the control stick. Strange had to push himself up and throw the remnants of the seat outside before he could regain control of the aircraft, which was by then flying dangerously close to the ground. Then he was able to fly back to base. Many of his colleagues back at base doubted his wild story, but after the war it was at least partly confirmed by a report from a German gunner who claimed he'd shot down a British Martinsyle after the plane had gone into a spin and the pilot had fallen out. German troops spent half a day looking for the wreckage of that plane, but did not find it. Strange's story is certainly unusual, but the difficulties with the position of the machine gun were typical. The problem was solved when Anthony Fokker, a brilliant, young aircraft designer working for the Germans, employed a little known invention of Swiss engineer Franz Schneider: the interrupter gear. This device allowed the gun to fire when the propeller was horizontal, but stopped it when the blade was vertical. This made the airplane a very effective killing machine. 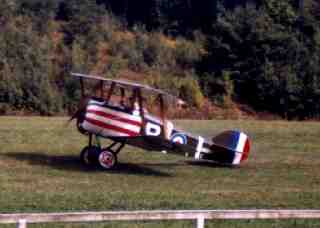 A W.W.I Sopwith biplane heads for a takeoff. Soon the war had a new type of hero: the flying ace. An ace was a pilot that managed to shoot down five enemy aircraft. Perhaps the earliest was the German Max Immelmann who invented many of the early combat maneuvers (such as the Immelmann loop). Immelmann's career was cut short after 15 "kills" when the interrupter gear failed and his machine gun shot off the propeller of his plane at 6,000 feet. He died in the the ensuing crash. Each nationality had their leading aces by the end of the war: the British Major Edward Mannock with 73 kills, the French Capt. Rene Fonck with 75 kills, the Italian Lt-Col. Francesco Baracca with 36 kills, the American Capt. Eddie V. Rickenbacker with 26 kills. 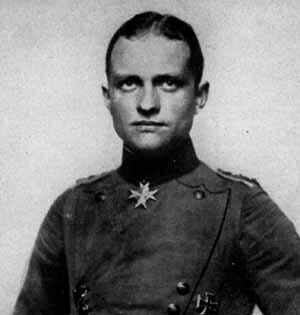 The leading ace of the war was the German Baron Manfred von Richthofen with 80 kills. Baron Manfred von Richthofen, also known by the nickname "the bloody red Baron," like so many of the great fighter aces did not survive the war. His legend, however, lived on in popular culture through the rest of the century. Richthofen was born in 1892 to a family of landed gentry from East Prussia. At age eleven it was decided (without his consent) that he be a professional soldier and he was enrolled as a cadet. He led an undistinguished career until he was transferred to the Air Service as an observer in 1915. He quickly became a pilot, though he crashed on his solo flight, and scored his first combat victory early in 1916. Richthofen was a coldly calculating warrior, carefully selecting his targets and avoiding traveling over enemy lines where he would be captured if his machine were downed. Some of his enemies faulted him for this, thinking it was "unsporting," but the Richthofen's care in battle probably explains why he survived long enough to roll up such an impressive score. Being a fighter pilot in W.W. I was extremely dangerous. Often novices did not even see the planes that shot them down. Pilots who survived to be veterans often became victims of battle exhaustion. The constant danger unnerved them. The circumstances of Richthofen's death are even today controversial. The Royal Air Force claimed their pilot Canadian Roy Brown had killed him, though Brown only claimed that he had shot at a plane that looked like Richthofen's and had not seen it crash. It seems more likely Richthofen, his judgment clouded by battle fatigue, was killed when he pursued novice pilot Lieutenant May at low level over Allied lines. The Baron's plane was protected from ground fire as long as he remained close to May's tail, but when he broke off his attack, perhaps due to jammed guns and turned back to German lines, he became the target of concentrated anti-aircraft fire. 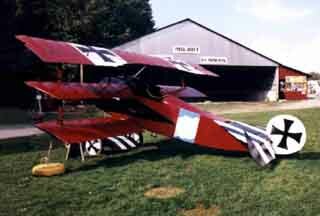 These shots probably killed him before his plane even hit the ground..
A replica of a Fokker Triplane painted in the colors favored by Manfred von Richthofen, the "Red Baron." The three winged configuration shortened the width of the plane making for tighter turns in combat. The war had pushed aviation technology forward at a blinding pace. By the close of the hostilities in 1919 factories were experimenting with fighter planes, such as the Curtiss 18T, that sported 400hp engines which could pushed the aircraft to top speeds of over 160 miles per hour while carrying their heavy, and deadly, burden of weapons. Nobody denied the vital contribution aircraft had made to the outcome of the war especially in reconnaissance or the bravery of their pilots. 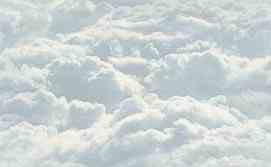 The world recognized that the airplane had grown up and the early days of aviation were over.